Hello! I was so excited to be chosen as a Guest Designer for Jaded Blossom for December 11th. It is quite the honor and I appreciate it so much! First, I would like to express my sincerest gratitude to Candace & Michelle for allowing me to showcase their wonderful products on the blog! 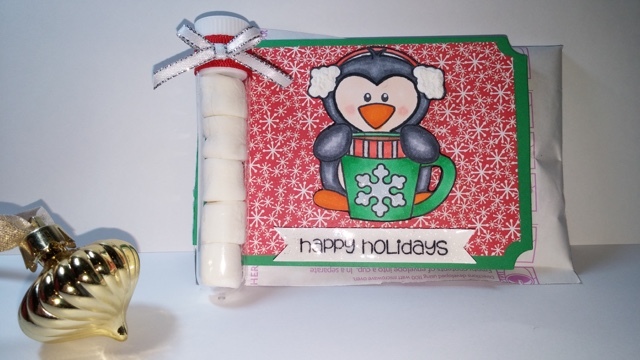 I created a favor pack of hot cocoa and marshmallows. I used Jaded Blossom's Winter Penguin stamp set and Ticket Book Die Set. The test tubes are food safe and I purchased them from eBay. This next photo shows the project vertically, if you are familiar with the Ticket Book die, there is a flap on the other side, that you can personalize to add the recipients name or your name as the giver. Thank you again to the Jaded Blossom Team! Wishing you and yours a very Merry Christmas and Happy New Year!! This is SUPER CUTE! Love how you created the tag for the hot chocolate and the fun tube with the marshmallows! omg..this is so sweet!! Your penguin is adorable!!! This is adorable ... wonderful idea!! This is fantastic! Awesome Idea! What a fun idea!! So perfect for gift giving! Great job of showcasing JB products! Congrats on your GD spot! Thank you so much ladies! I appreciate the comments! I forgot to include my blog if anyone wants to check out my other projects! 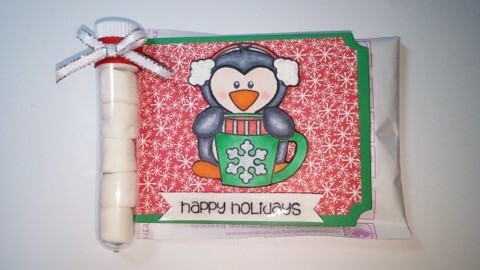 Wonderful gifting idea and use of the ticket die Candice! I have always loved penguins and they remind me of winter so much! cute, cute, cute. Love this. Oh gosh...what a sweet gift idea!